The blood-thinner Xarelto can cause uncontrolled bleeding — a dangerous and possibly fatal side effect for which there is no antidote. Plaintiffs who say they were harmed by the drug and family members who lost loved ones to severe bleeding filed lawsuits against Bayer, the drug’s maker. They claim Bayer failed to warn them and manufactured a faulty drug. Rivaroxaban is the first oral factor Xa inhibitor approved in the US to reduce the risk of stroke and blood clots among people with non-valvular atrial fibrillation, treat deep vein thrombosis (DVT), treat pulmonary embolism (PE), reduce the risk of recurrence of DVT and PE, and prevent DVT and PE after knee or hip replacement surgery. The objective of this study was to evaluate the costs from a hospital perspective of treating patients with rivaroxaban vs other anticoagulant agents across these five populations. An economic model was developed using treatment regimens from the ROCKET-AF, EINSTEIN-DVT and PE, and RECORD1-3 randomized clinical trials. The distribution of hospital admissions used in the model across the different populations was derived from the 2010 Healthcare Cost and Utilization Project database. The model compared total costs of anticoagulant treatment, monitoring, inpatient stay, and administration for patients receiving rivaroxaban vs other anticoagulant agents. The length of inpatient stay (LOS) was determined from the literature. Across all populations, rivaroxaban was associated with an overall mean cost savings of $1520 per patient. The largest cost savings associated with rivaroxaban was observed in patients with DVT or PE ($6205 and $2742 per patient, respectively). The main driver of the cost savings resulted from the reduction in LOS associated with rivaroxaban, contributing to ∼90% of the total savings. Furthermore, the overall mean anticoagulant treatment cost was lower for rivaroxaban vs the reference groups. The distribution of patients across indications used in the model may not be generalizable to all hospitals, where practice patterns may vary, and average LOS cost may not reflect the actual reimbursements that hospitals received. From a hospital perspective, the use of rivaroxaban may be associated with cost savings when compared to other anticoagulant treatments due to lower drug cost and shorter LOS associated with rivaroxaban. The classic medication for chronic anti-coagulation is coumadin, but it is problematic. Coumadin impedes the production of coagulation proteins that depend on vitamin K (factors 7, 9, 10, and 2, in order of half-lifes, which range 2-72 hours). Consequently, a change in dose today does not have full impact for 2-3 days. Physicians and pharmacists have difficulties adjusting the dose to its target effect on the biomarker test International Normalized Ratio (INR). The therapeutic range is very narrow. A change in intake of leafy green vegetables can have profound impact (by changing intake of vitamin K). A change in virtually any medication or vitamin that can bind to albumin can also profoundly change the INR to a life-threatening level, because 80% of coumadin is inactivated by binding to albumin, and displacement of coumadin by other agents can boost the effective circulating amount. Those limitations, and the need for testing each month and each medication change have stimulated the development of alternatives. For example, rivaroxaban is a new anticogulant that focuses on factor 10 (factor X), deemed as good as coumadin without the need for the blood tests. In fact, INR test for rivaroxaban is misleading, as values may range as high at 7 (“DANGER”) at normal therapeutic dosing. The following reviews some of the data on that unexpected issue. Physicians not aware of this “false positive” have demanded stoppage of therapy due to the inapplicable spuriously high INR values. Dabigatran is an oral direct thrombin inhibitor that has been shown to be an effective alternative to warfarin in patients with atrial fibrillation. We evaluated the use of dabigatran in patients with mechanical heart valves. The trial was terminated prematurely after the enrollment of 252 patients because of an excess of thromboembolic and bleeding events among patients in the dabigatran group. In the as-treated analysis, dose adjustment or discontinuation of dabigatran was required in 52 of 162 patients (32%). Ischemic or unspecified stroke occurred in 9 patients (5%) in the dabigatran group and in no patients in the warfarin group; major bleeding occurred in 7 patients (4%) and 2 patients (2%), respectively. All patients with major bleeding had pericardial bleeding. Edoxaban, a novel factor Xa inhibitor, met its primary endpoints in a trial that pitted it against warfarin for treatment of symptomatic venous thromboembolism, a study found. Note that edoxaban appeared to work best in the highest-risk patients and was associated with significantly less bleeding compared with warfarin. AMSTERDAM — Edoxaban, a novel factor Xa inhibitor, met its primary endpoints in a trial that pitted it against warfarin for treatment of symptomatic venous thromboembolism (VTE). Among more than 8,000 patients with deep-vein thrombosis (DVT) or pulmonary embolism (PE), 130 (3.2%) of the patients treated with edoxaban had a recurrent, symptomatic VTE versus 146 (3.5%) warfarin-treated patients, a hazard ratio of 0.89 (95% CI 0.70-1.13, P<0.004 for non-inferiority), Harry R. Büller, MD, of the Academic Medical Center, Amsterdam, reported in a Hot Line session at theEuropean Society of Cardiology meeting here. The safety endpoint was bleeding (major or clinically relevant non-major bleeding), and in that analysis edoxaban was superior to warfarin, as 8.5% of the edoxaban patients had bleeding events versus 10.3% of the patients in the warfarin group (P=0.004 for superiority). Moreover, edoxaban appeared to work best in the highest-risk patients — 938 patients with pulmonary embolism and right ventricular dysfunction assessed by N-terminal pro-brain natriuretic peptide levels. In those patients, the recurrent VTE rate was 3.3% in the edoxaban group versus 6.2% in the warfarin group, Büller said. Based on the results in that very high risk population, Büller predicted that clinicians treating those patients will consider that efficacy profile when selecting an oral Factor Xa inhibitor. The study, from the Hokusai VTE Investigators, was simultaneously published online by the New England Journal of Medicine. In the highly competitive oral anticoagulant group, those numbers look good, but at first blush the two already approved Factor Xa inhibitors, rivaroxaban (Xarelto) and apixaban (Eliquis) looked better when they were studied in VTE. In EINSTEIN-VTE, rivaroxaban had a recurrent symptomatic VTE rate of 2.1%, and 8.1% of patients met the safety endpoint. Likewise, in another VTE trial — AMPLIFY-EXT — apixaban (2.5 mg or 5 mg twice a day) had a recurrent or VTE-related death rate of 1.7%, and 3.2% of the patients who received low-dose apixaban reached the safety endpoint, as did 4.3% of patients treated with 5 mg of apixaban. Asked if there was a specific population that might benefit from edoxaban versus rivaroxaban or apixaban, O’Gara, who is director of clinical cardiology at Brigham and Women’s Hospital and a professor at Harvard Medical School, said the findings from the Hokusai researchers did not provide that answer. The attempt at a cross-trial comparison drew harsh criticism from Elliott Antman, MD, principal investigator in a trial of edoxaban for prevention of stroke in patients with atrial fibrillation (ENGAGE-AF). Moreover, unlike the VTE studies of apixaban and rivaroxaban, all patients in the Hokusai trial received heparin for 5 days. After that heparin run-in, patients were randomized to edoxaban or to warfarin. The median duration of heparin after randomization was 7 days. Antman said that design best replicated real-world clinical practice, in which heparin is usually started before warfarin. The Hokusai-VTE trial recruited 4,921 patients with DVT and 3,319 patients with PE. Patients initially were treated with heparin, and then were randomized to edoxaban (60 mg or 30 mg) or warfarin. There was an overlap of the heparin therapy when warfarin was started. During a press conference, Keith Fox, MBChB, chair of the ESC scientific program, asked Buller if that overlap could have increased bleeding risk in the warfarin arm, thus introducing bias, but Buller said the overlap merely allowed warfarin to reach therapeutic range. The edoxaban regimen “may be less handy, especially for early-discharge patients… [though] some doctors may feel more comfortable starting with low molecular weight heparin and then switching to edoxaban for the one-third of patients with severe PE,” Konstantinides said. The average age of patients in the Hokusai study was 56-57, and just over half were men. Patients were enrolled from January 2011 through October 2012 at 439 centers in 37 countries. About 40% of patients were treated for a year, and 80% of the edoxaban group was adherent to study treatment. Among the warfarin patients, average time in therapeutic range was 63.5%. The study was supported by Daiichi-Sankyo, which is developing edoxaban. Buller reported personal fees from Daichi Sankyo during the study, as well as grant support and personal fees from Bayer Health Care and Pfizer. He also received personnal fees from Boehringer Ingelheim, Bristol-Myers Squibb, Isis Pharmaceuticals, and ThromboGenics outside the submitted work. Antman has a research grant from Daiichi-Sankyo through Brigham and Women’s Hospital. O’Gara said he had no financial disclosures. Pathological thromboembolism, as seen in Myocardial Infarction or stroke, led to the use of low dose aspirin as an-antiplatelet drug, as a prophylaxis for subsequent intravascular thrombotic episodes. Aspirin, an irreversible Cyclo-oxygenase inhibitor, resulted in a reduction of the production of Thromboxane A2, which in itself is a powerful vaso-constrictor and a platelet aggregator. Certain limitation with the use of aspirin necessitated the search for newer anti-platelet drugs, with a quicker onset of action, quick termination of action on cessation of treatment, and minimal side effects like bleeding. ADP inhibitors like Clopidogrel, which inhibits the ADP dependent activation of Glycoprotein IIb/IIIa receptors, was the next in the armamentarium of these drugs. Later, oral anti-coagulants like coumadin (warfarin sodium) were added to anti-platelet approach, to tackle the overactive coagulation cascade in pathological intravascular thrombosis. Warfarin is a drug which counters the effects of Vit-K on the synthesis of coagulation factors in the liver. Thus, all green leafy vegetables, which contain high amounts of Vit-K, will interfere with the action of Warfarin. Moreover, warfarin is extremely prone to drug interations, owing to its biotransformation by hepatic microsomal enzymes, which are also metabolizing many other drugs. Thus, a therapeutic drug monitoring of warfarin action is mandatory, which, is a big limitation to its use. The quest for pharmacologically superior oral anticoagulants, as compared to Warfarin, reached an important milestone with the discovery of two major drugs, Dabigatran and Rivaroxaban. Both these drugs are Direct Thrombin Inhibitors, though the indications and adverse events are somewhat different. This post will discuss Rivaroxaban pharmacology in brief, and address certain clinical issues. Question: Does rivaroxaban or dabigatran affect the PT or INR? Can either be monitored using the PT or INR? Warfarin is the most commonly used anticoagulant for the prevention of thrombosis or stroke. Because of a narrow therapeutic window, it requires regular coagulation monitoring of the prothrombin time (PT)/international normalized ratio (INR). As such, the inconvenience of frequent blood draws remains a major burden. For the first time in over 50 years, 2 new oral anticoagulants, dabigatran, a direct thrombin inhibitor, and rivaroxaban, a factor Xa inhibitor, were approved by the US Food and Drug Administration. While these anticoagulants carry similar side effects to warfarin, such as risk for gastrointestinal bleeding and intracranial hemorrhage, INR and PT monitoring are not required. How then are providers to gauge the safety and efficacy of the medication in a patient? Can clinicians monitor these medications with the conventional coagulation assays, or are they rendered useless? The effect of both dabigatran and rivaroxaban on commonly used coagulation assays has been evaluated in the literature, both in vitro and in vivo. The usefulness of these tests relates directly to the medications’ mechanisms of action. For both agents, the use of an INR to determine the effectiveness and safety is meaningless because INR is calibrated for use with vitamin K antagonists (such as warfarin) only. Although use may be associated with an increase in INR, this increase does not relate to the effectiveness of therapy or provide a linear correlation of concentration and effect that is seen when measuring warfarin levels. [2,3] In some instances, point-of-care INR measurements have been drawn on patients using dabigatran; however, the results have failed to correlate to appropriateness in therapy and have varied greatly case by case. As dabigatran directly inhibits thrombin, PT measures lack the sensitivity to detect therapeutic levels. [1,5] Often, if this assay is measured in patients taking dabigatran, a subtherapeutic level is noted, regardless of concentration of dabigatran. More appropriate assays for dabigatran may be activated partial thromboplastin time (aPTT), diluted thrombin time (TT), or ecarin clotting time (ECT). These tests are better able to capture changes throughout the clotting cascade. Using aPTT may underestimate high levels and could be used more as a qualitative assessment of activity instead of a quantitative assessment. Where available and if desired, monitoring via the diluted TT or ECT has proved a more useful measure for dabigatran. 2.7 million BSN-prepared RNs will be needed by 2020. There’s never been a better time to take advantage of accredited nursing degree programs designed to fit your busy schedule. 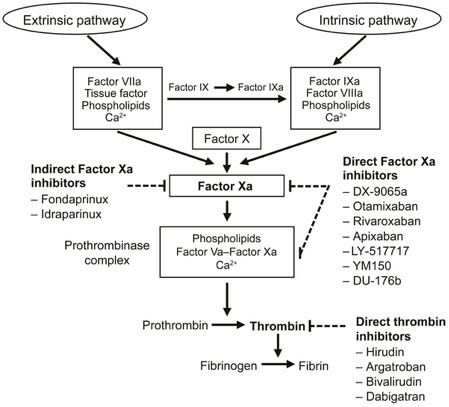 Unlike dabigatran, studies have demonstrated a correlation between the levels of rivaroxaban and PT through inhibition of factor Xa, but not to the same extent as warfarin. In some instances, the use of PT monitoring for this medication may be useful. 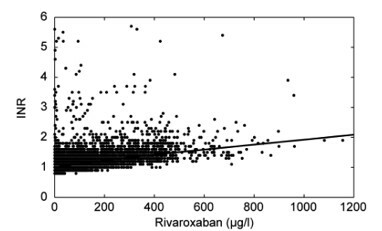 A linear response between PT and rivaroxaban can be seen; however, the accuracy of the test improves when concentrations of rivaroxaban are higher. Additionally, the use of PT for monitoring rivaroxaban can be difficult because the measurement differs greatly depending on the reagent used to determine PT. Calibrating PT assays to assess rivaroxaban appropriately is an option currently being evaluated. In conclusion, the INR is not a viable option when assessing the use of dabigatran or rivaroxaban. Additionally, PT is not a viable option when monitoring a patient on dabigatran. However, PT may be an option for monitoring select patients on rivaroxaban until more reliable standardized tests are developed. Methods of measuring the effectiveness of these agents are currently being developed and tested; however, until they are made available, the existing tests may be adapted to be used in a more effective manner. The author wishes to acknowledge the assistance of Jacqueline M. Kraft, PharmD, Ngoc Diem Nguyen, PharmD, and Phillipa Scheele, PharmD, PGY1 Residents, and Michael P. Conley, PharmD, and Nga T. Pham, PharmD, CDE, AE-C, Assistant Clinical Professors at Northeastern University — School of Pharmacy and Harbor Health Services, Inc., Boston, Massachusetts. Favaloro EJ, Lippi G. The new oral anticoagulants and the future of haemostasis laboratory testing. Biochem Med (Zagreb). 2012;22:329-341. O’Riordan M. Falsely elevated point-of-care INR values in dabigatran-treated patients. Heartwire. July 7, 2011.http://www.theheart.org/article/1251461.do. Accessed January 11, 2013. PRADAXA represents progress in helping to reduce the risk of stroke due to atrial fibrillation (AFib) not caused by a heart valve problem. Review the chart below to compare PRADAXA and warfarin (also known as Coumadin® or Jantoven®). And find out why your doctor may choose PRADAXA. Remember, only your doctor can decide which treatment may be right for you. Both PRADAXA and warfarin are anticoagulants. These blood-thinning medicines help to stop clots by targeting factors your blood needs to form clots.PRADAXA and warfarin work differently to help reduce the risk of stroke due to AFib not caused by a heart valve problem. PRADAXA is a direct thrombin inhibitor that helps to stop clots from forming by working directly on thrombin.PRADAXA is not for use in people with artificial (prosthetic) heart valves Warfarin is a vitamin K antagonist that helps to stop clots from forming by interfering with vitamin K—a vitamin your body needs to form clots. PRADAXA and warfarin help to stop clots by targeting factors your blood needs to form clots. In a clinical trial of more than 18,000 people, PRADAXA 150 mg capsules was proven superior to warfarin at reducing the risk of stroke. Warfarin has been extensively studied and prescribed by doctors to help reduce the risk of stroke in people with AFib since 1954. How you take the medication: PRADAXA is taken by mouth 2 times each day. Warfarin is taken by mouth once every day. Dosing options: PRADAXA comes in 75 mg and 150 mg strengths.Your doctor will decide which dose is right for you based on a simple kidney function test. Warfarin comes in 1 mg, 2 mg, 2-1/2 mg, 3 mg, 4 mg, 5 mg, 6 mg, 7-1/2 mg, and 10 mg strengths.Your doctor will decide which dose is right for you. He or she will adjust your dose based on the results ofregular blood tests.Based on these tests, your doctor will determine your dose and adjust it, if necessary. Monitoring: No need for regular blood tests.PRADAXA has been clinically proven to help reduce the risk of stroke in people with AFib not caused by a heart valve problem. And, unlike warfarin, there is no need for regular blood tests to see if your blood-thinning level is in the right range. Learn more Requires regular blood test.Warfarin has also been proven to be an effective blood thinner. When you take warfarin, you need to have a regular blood test to measure International Normalized Ratio (INR) to determine the time it takes for your blood to clot. Dietary restrictions: No dietary restrictionsPRADAXA requires no changes to your diet. Dietary restrictions requiredWhen you take warfarin, you need to limit foods high in vitamin K, such as large amounts of leafy green vegetables and some vegetable oils. This is because Vitamin K can affect the way warfarin works in your body.You may also need to limit alcohol, cranberry juice, and products containing cranberries. Atrial Fibrillation: Take XARELTO® 1 time a day with your evening meal. If you miss a dose of XARELTO®, take it as soon as you remember on the same day. Take your next dose at your regularly scheduled time. Your doctor may stop XARELTO® for a short time before any surgery, medical or dental procedure. Your doctor will tell you when to start taking XARELTO®again after your surgery or procedure. Rivaroxaban, chemically an oxazolidinone derivative, is a directly acting Coagulation factor Xa inhibitor, acting on both free Factor Xa as well as that bound to the Prothrombinase complex. It has a good oral bioavailability (~ 80-100%) and a rapid onset of action, with peak plasma concentrations being achieved in about 2-4 hours of oral intake. It is about 95% plasma protein bound, with an aVd of about 50L. It is partly metabolized in liver and excreted both unchanged as well as inactive metabolites in the urine, so also in the feces. Strong CYP3A4 inhibitors like Ketoconazole, Ritonavir, Clarithromycin, Conivaptan etc can increase the pharmacodynamic effects of Rivaroxaban by a gross reduction in its metabolism. Weaker CYP3A4 inhibitors like Amiodarone, Azithromycin, Diltiazem, Dronaderone, Erythromycin, Felodipine, Quinidine, Ranolazine, Verapamil maybe used with Rivaroxaban except in renal impairment. Similarly, enzyme inducers like Rifampicin can decrease the plasma concentrations of Rivaroxaban. Indications : Prophylaxis of stroke and systemic embolism in patients of atrial fibrillation, treatment and prevention of Deep Vein Thrombosis (DVT) and Pulmonary Embolism (PE). Dosage : 10-20 mg with or without food, depending on the indication. Adverse Effects : As with any other anticoagulant, an increased risk of bleeding. An increased risk of stroke after discontinuation of the drug in atrial fibrillation, and spinal and epidural hematomas. Therapeutic monitoring : Both Dabigatran and Rivaroxaban do not mandate a therapeutic monitoring clinically, as in the case of Warfarin. 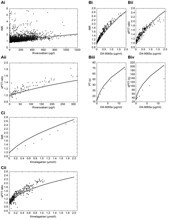 Moreover, both Prothrombin Time (PT) as well as the International Normalized Ratio (INR) are not suitable to measure the pharmacodynamic profile of Rivaroxaban for various reasons1. Development of novel methods of assays, for instance Anti Factor Xa assay which utilizes rivaroxaban containing plasma calibrators, may provide optimal therapeutic monitoring modalities for Rivaroxaban in the future. Figure – 2 : PT and aPTT dependent on plasma concentration of anticoagulant drugs. (C) ximelagatran (experimental data for PT and aPTT from the literature. aPTT, activated partial thromboplastin time; INR, international normalized ratio; PT, prothrombin time. There is some concern regarding a spurious rise in the INR values if a patient stabilized on warfarin is switched over to Rivaroxaban. This concern is ill-founded since it is already mentioned above that INR is not a suitable investigation to give an indication of Rivaroxaban pharmacodynamics. Moreover, no suitable litrerature is available which can explain the rise in INR values on Rivaroxaban administration. It may require some additional clinical studies to throw some light on this clinical anomaly. Lindhoff-Last et al. Assays for measuring Rivaroxaban : Their suitability and Limitations. Ther Drug Monitoring Dec 2010 (32, Issue 6): 673-79. Copyright © McGraw-Hill Education, LLC. All rights reserved. Very well presented information concerning these new anticoagulants. The bleeding concerns me with Xarelto. I was at a talk about some of these new agents and for some reason it really scared me so much I don’t feel I would ever take them. However if they get enough pharmacovigilance data in the next while possibly those adverse events were just trial related. 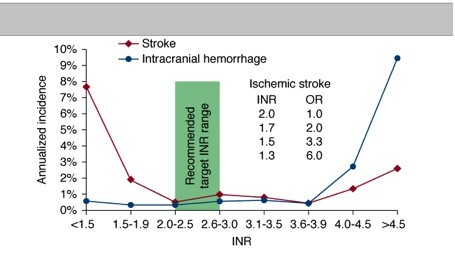 Hoping that is the case because the decrease in secondary stroke risk was substantial.